For years we’ve been hearing about the annual DEMA Show (Diving Equipment and Marketing Association) and this year we decided to see what all the hubub was about. What an action packed weekend. There were hundreds of seminars to choose from; the hard part was deciding where to focus. Over the three days, we attended sessions that provided information about the general state of affairs in the PADI diving community over the past few years, PADI eLearning, becoming a PADI Course Director, the Dancer Fleet in Indonesia and the Aggressor Fleet, resort sales training, pricing workshop, DAN seminars on Diving Fatalities and on Unseen Hazards in Diving, risk management for instructors, and Matthew attended the IDC Staff Instructor update. Whew. A lot of information. At the IDC Staff Update Matthew received some great information about changes that are coming to the divemaster program in 2011; you’ll hear more about that in the future, and if you have questions do not hesitate to ask! In addition to the seminars, there was an exhibition – dive shops, manufacturers, travel, gear, everything you could think of. 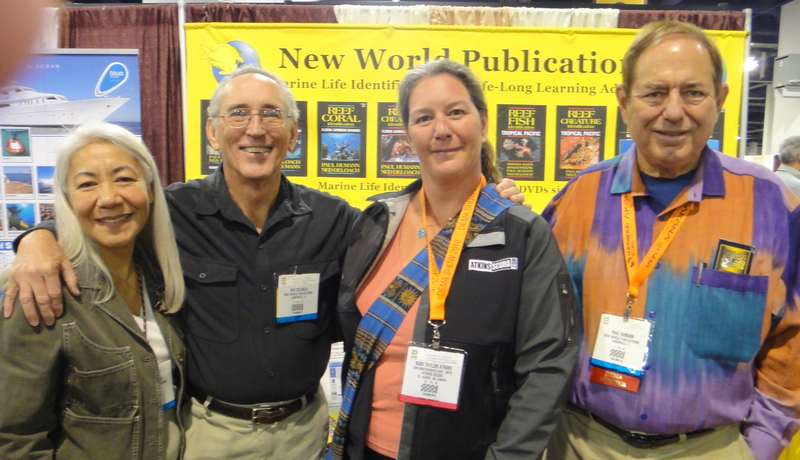 The highlight of the show for me was the New World Publications booth, where I met some of my fish-nerd heroes. Paul Humann and Ned and Anna DeLoach manned the booth, and if you know me, you know that I have every book those people have put out. What an honour to meet them all! While there, I picked up the new “Reef Environmental Education Foundation‘s Beginning Course on Reef Fish ID”; we’ll be using that as training materials in upcoming AWARE Fish ID classes. While on the exhibit floor, we did a little shopping getting ourselves some new SeaCure mouthpieces (molded to an individual mouth), a new mask or two, compass, lift bag, and most exciting, we ordered a couple of “Nautilis Lifeline” devices. They’re a GPS radio for divers, by a company out of Vancouver area. Very cool. We also did some scouting for possible locations for future dive trips; keep your eyes and ears open for updates on that. In amongst all the seminars and shopping, we also attended the DEMA Awards Party. We had a fantastic time! 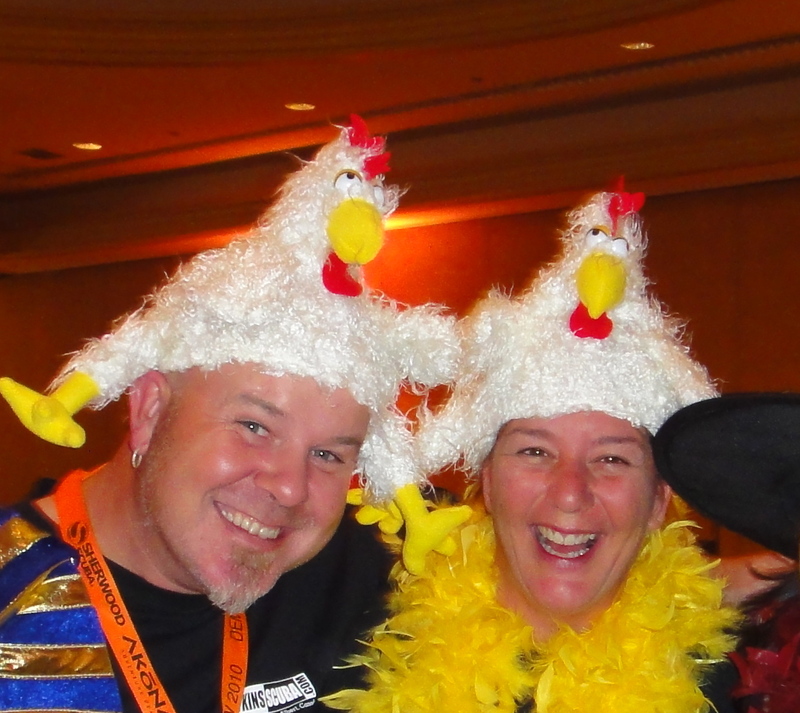 We met some great people, and we rocked our chicken hats. The migration south is complete for this year, and we’re now up and running in Cozumel, Mexico. Matthew is busy working at Blue Angel Resort as an Instructor and Divemaster, so if you’re in the area stop by to visit! We recently had two of our students from Edmonton arrive to complete their Open Water Scuba Diver course. Here they are with some friends (who did a Discover Scuba Diving experience with Matthew) wet and happy! We also visited the east side of the island last week to help with the turtle release. You can read about that adventure in Kari’s blog. We hope to see you this winter in sunny Mexico!